And Tina is STILL so insightful. Glad she wasn’t affected by the demon closing vacuum. Relax ladies, Bill Murray is nowhere in sight. “Your auras auras are glowing…”? Their aura’s are so bright, they’re giving off their own auras. Why does this feel like a series finale? More like a season finale. Depends on which side of the pond you are. and we all know that UKside is the only side that counts, what with USside being nothing more than an errant colony. Um… no it doesn’t matter. Unless UK does series in only one season. Series finale means it’s the end of the series. No more episodes. Maybe some cheesy reunion movies, but the show is O. V. E. R.
Season finale means it’s just the end of the season and unless the network/producers, etc decide otherwise, you will see more of it. Well, I can see where they would say series finale… If they say each season is a series by itself. This song is over, but the story never ends. Yep we’re just a errant colony with more land, people, and resources than you Brits. When I was in college, we had to explain to a girl from China what Groundhog Day is. We then had to explain to her what a groundhog was. Do you know how hard it is to explain to someone what a groundhog is when they’ve never seen one? BTW great strip as always, Paul. yeah sure… a picture is worth a thousand words. failing that, a dictionary applied liberally to the skull should suffice. I dunno–a fat little rodent that lives in burrows in the ground? Okay, which is gonna be the better untrained psycho-analyst – the barista or the bartender? Depends on where they’re heading, though. They might be heading to the Cerberus Club……..
Daren’s is a bar, not a nightclub… not really flashy lights and dance floors. As they are looking for in Cerberus club, plus, they seem to “know the owner” and etc… so they have… well.. somewhat unrestrained access it seems, with openly poiting into the club at times, etc. And it should be “auras’ auras,” because there’s more than one aura. It’s been something like a decade since I first saw Groundhog Day, and this is still the best reference to it ever. Awesome! In recent years, Ma would make sure we had some sausage to eat on Feb 2nd. When she would mention it, somebody would have to ask why. 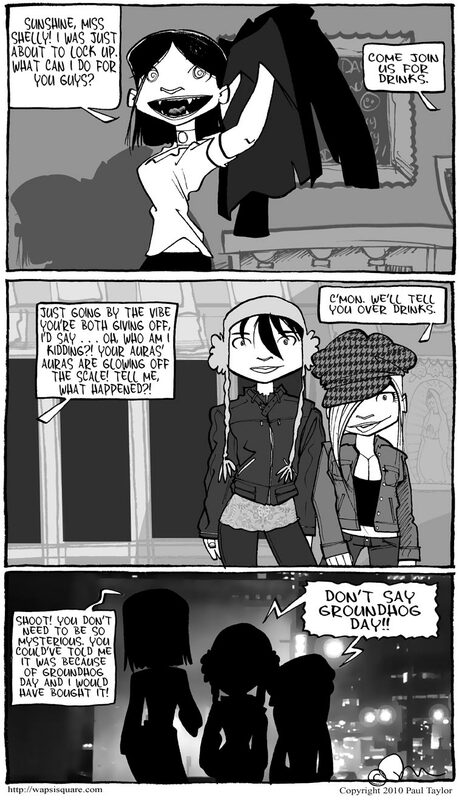 “Ground Hog.” she’d say. So today’s installment makes me crave breakfast and Bill Murray movies. You actually crave Bill Murray movies? My deepest condolences. On the DVD, Harold Ramis states that the original idea was for Bill Murray to live February 2nd for about 10,000 years. Later he says that “Phil” (Bill) probably lived the same day for about 10 years. So he lived the same stretch of time around 3652 times, puts the whole 57 or so times of our story in perspective. Ah fashions … you’ll cringe to look at yourself that way 10 years from now. You think you’re hot stuff now. So did all those people (black and white) who sported blow-out afros at one time. Giggles should ensue when you see a picture of yourself in one of those knit caps with the dorky long … umm … what ARE those hangy down things on Shelly’s cap called anyway? They all look so *happy*. YAY! Unless I’m mistaken, Monica’s hat is a “chullo,” a peruvian/inca knitted cap, and those dangly thingies hanging off the ear flaps are ties, but it’s totally uncool to tie them apparently, because you never see anybody doing it. — tying your chullo ties is evidently as uncool as snapping the chinstrap on your bill cap with fuzzy ear flaps — which is the ultimate fashion fox pox. Shelly is the one wearing the chullo. =) Monica is wearing a newsboy hat. Glad I’m not the only one around old enough to remember Veronica Lake. Which is who Jessica Rabbit got that whole long blond hair vibe thing from. Monica in a chullo, and Esther Chuah who draws “Catalyst” is doing an internship in Quito, Ecuador. Coincidence? or Not! So, exit girls with bodacious auras, and friend, to the strains of “El Condor Pasa” off in search of celebratory refreshments. Works for me. Girl’s night out! They deserve it! Awww, but Tina cut her hair! 🙁 I liked her with the long, flowing raven-locks! Whoa! And i didn’t even notice! Yes, women who cut their attractive long, flowing hair are much like Samson in that they lose a lot of their “power” when they do. slowly seems like all the Wapsi-women are cutting there hair short. Shelly started a trend. Poor M’s gonna be next. Love the fashions in the second panel! Now for the ominous return of Roy! An annoying feature of the current site design is that when i click on “Comments”, it takes me to the bottom of the list, so that i have to scroll back up to read existing posts. It must be browser specific. It takes me to the top of the comments. I have to scroll up a bit to get back to the art. I’m using Firefox, and I get taken to the bottom as well. But a quick tap on the “Home” key returns me to the top. Does it in Google Chromium and Arora too. Anybody else dig that Stargate SG-1 episode with the time loop? Especially when the abuse starts? I like the golf bit. At the end, I personally was amazed at Richard Dean Anderson being able to eat oatmeal sexily at Sam. That’s some acting, er, chops. Love love LOVE the outfits M and Shelly are wearing. Rowr to both of them. I read this three days in a row and that groundhog day joke keeps getting funnier each time! I just had a thought: what would be the first thing that Mayahuel would say to Tina upon seeing her? After which, we find out that she gave Tina a bit of the Golem formula as payback for killing herself to protect Monica.